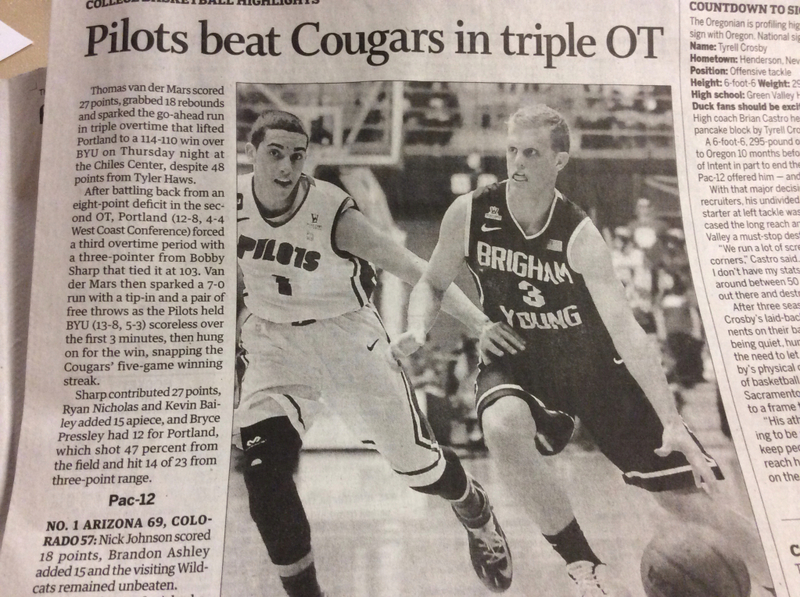 Had to look this one up.....tonight was the first time EVER that UP has beaten BYU in men's basketball. Before tonight, BYU led the series 9-0. I don't know if the student section knew that factoid when they rushed the court for the second time in two home games, but I loved the way they way carried Bobby around the court on their shoulders. It's great to see the student/athletes are actually good friends with many of the students....one doesn't see that everywhere. Pilots are now 4-4 in league and alone in 6th place, after 6 home games and 2 road games. 3-3 at home, 1-1 on the road. I think a split road trip is reasonable, although we wanted better. If you had told me before league we'd be 3-3 at home after playing GU, SMC and BYU, plus USF, SCU and UOP, I'd have said, "not surprising". How it happened though, that's a surprise! BYU version of the game. Sometimes there are games that you just can’t forget — the ones so memorable that they’re burned into your brain. They stay with you for years afterward. You remember where you were when they happened. You remember the roller coaster of emotions you felt as you sat transfixed by the events unfolding before your very eyes. As a fan, you either love those games or you hate them. Because after all of that investment — all that time, all that energy, all the emotion — your team is either going to come away the conquering hero or the heartbroken loser. There are no other options. As painful as it was to watch a win slip away, this was still a fantastic game. There’s no other way around it. DoubleDipper wrote: Kudos to the UP Student Section tonight.....well done!! The "YOUR MOMS ARE HOT" sign cracked me up. Juvenile humor at its best. Just skimmed through the BYU forum. Requesting clarification. BYU (more specifically, Haws) went on a quick 8-0 run in the second half about six minutes in or so after the Pilots went up 11. After his first bucket, what in the world was the call that gave BYU the ball right back, leading to an immediate three by Haws? DeanMurdoch wrote: Requesting clarification. BYU (more specifically, Haws) went on a quick 8-0 run in the second half about six minutes in or so after the Pilots went up 11. After his first bucket, what in the world was the call that gave BYU the ball right back, leading to an immediate three by Haws? They called a foul on Bobby Sharp in the positioning for a rebound. He was screened from us, so couldn't see exactly what he did. Holding, I presume. Quick 5 point play for them. I plan on going over the replay to get a better understanding of the calls. Then DoubleDipper and I can compare notes of our analyses. You can get all the info you need in the O this morning. Just checked the hard copy. Three paragraphs. PurpleGeezer wrote: You can get all the info you need in the O this morning. "Two teams compete in basketball. Individuals from both teams contributed to the outcome. NO 1 ARIZONA 69, COLORADO 57..."
up7587 wrote: Perspective is a funny thing. We were incensed about the refs tonight; I called it 5 against 8. Checking some comments on the ESPN site, and the BYU fans were bitching about no calls. Waa? Becoming quite a tradition. Hey at least they weren't throwing garbage all over Chiles. Wait, they still print a hard copy of the O?! Hahaha, UP's biggest thug, Bobby Sharp extended an arm against 6-10/230 BYU super-star freshman, Eric Mika, and he went flying as if propelled by battering ram. It's at the 15:06 mark in the second half....Mica's teammates gave him hardy congratulations for his performance when they got back to their bench. I gotta admit, he did make it look good. I'm really surprised the so many fouls were called in this game given that the length of the game caused two of the refs to miss their Thursday night flight back to Salt Lake City, I'm told. Edit: I just looked at more "tape" of the game. At the 3:17 mark in the second half Alec is called for a foul as BYU #23 Halford goes stumbling past him while losing control of the ball and his body.....Alec swiped at the ball, but MISSED! I think these refs will be given a scolding, but the truth is, nothing will change because the game has just become too fast for them. I'd much prefer no-calls instead of calls that are purely guess work. What is that grey, wavy thing with the black letters and pictures on it? I've never seen a screen that can bend like that! They have a longer article on O-Live. Of course, it was written by the UP staff. For those who couldn't make it to the game and don't have cable (such as myself), theW.tv has a replay posted online: http://campusinsiders.com/network/wcc/videos/JraWxkazo31F97DgtdKuHnN42sg_4fFk. I heard the O compared to a close relative suffering dementia--it keeps diminishing because there are frequent subtractions from its resources: after all this loss it does not appear likely to make a comeback. Far from deserving derision because of its inability to give proper coverage to the Pilots, it deserves note as a dieing, but formerly great Oregon institution, which is trying to hang on, but apparently with mixed results. I have never cancelled my subscription partly because I know some former Pilots who happen to work there and partly I was hoping to slow the death spiral. I suspect it will be an online paper within the next couple of years. Congratulations Pilots. Great win for you all. Hope we can keep up our end of the weekend. Watched the end of regulation and the OTs. Sure looked like you tried to give it away a couple of times, but your kids just did not quit. Great game. The O was formerly great because it met the needs of the community. They forgot that it takes effort and resources to meet those needs. When you cut the resources you make the product less attractive. The dementia is on the part of those out of state owners who think generic content will be enough to retain readership because they are the only game in town. It ain't so. It is like any other business, if you don't provide the service you promise people go elsewhere. Now I look at the O mainly to see just how bad it has become. I'm actually hoping its demise comes sooner. Perhaps then an opportunity will open up for someone who can provide local content. What I really like, almost as much as the shot, is Alec flying off the bench.....he was into it!! The kid in section 8 beat him by 2 hops. the person in the red sweater right behind the bench beat them both. I really like this picture of Bryce; it looks like he is looking at the camera, not his man. It reminds me that during the game, Thomas fell to the floor under the basket, at the feet of the cameraman on a chair. He looked up right into the camera and smiled and waved. Hilarious. Forgot about that in all the OT tension. The guy in the lower left really summed up my emotions. Hands on head wondering how we let it slip away to pure joy!